Not exactly a good hair picture, since in it my hair is tied back and not really visible. 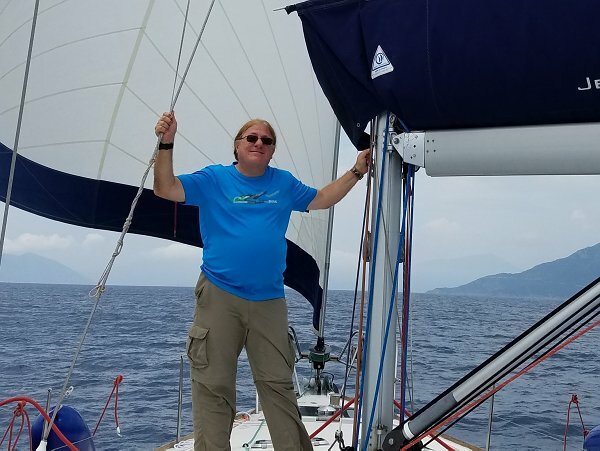 But I thought I'd post because I just returned from a one-week sailboat charter in Greece with my sailing club (Anthony, take note!) and had a great time. Although long haired men are not common in Greece, it seems they are less UNcommon than in other countries where I've been recently: Australia, the USA, and Israel. In Greece, one occasionally even sees older men who are balding on top, un-self-consciously wearing whatever hair remains for them long and untrimmed. I'd noticed this when I lived in Greece many years ago - I left 29 years ago and hadn't been back until last week - and was pleased to see it was still the case.